Monday is typically my busiest day of the work week as I get a lot of my projects for the week and have several that start and are due on each Monday so I don’t get a lot of time to blog on Mondays anymore. that being said, as I take a brief break from writing for work I get the chance to write for fun and thought I would share this really easy recipe I tried recently for some homemade oven fries. 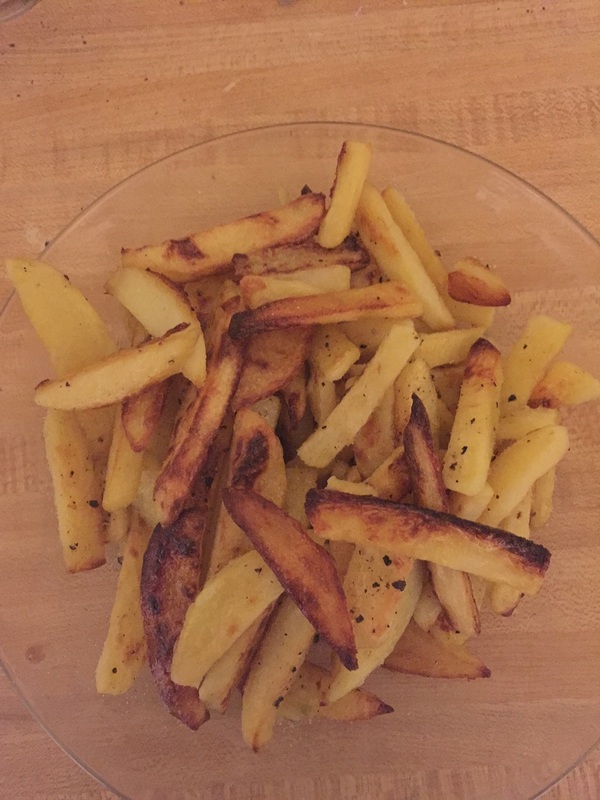 I have tried a few oven fries recipes in the past and have had mixed success with them, but so many of them seem to use a lot of oil in order to get the fries nice and crispy, something I have been trying to avoid doing when I can. I came across this recipe recently on Food52.com from Patricia Wells for a recipe she calls “fake frites.” The recipe seemed deceptively easy and simple to me so I was not quite sure if I was going to be happy with the results, but I was pleasantly surprised by what came out. Preheat the oven to 500 degrees. Bring 1 quart of water to a simmer in the bottom of a steamer pot or in a Dutch oven or large saucepan with a steamer basket insert in it. Place the potatoes on the steaming rack or in the steamer basket and place the rack in the steamer. Cover the pot and steam the potatoes just until a knife tip inserted in a potato comes away clean, about 10 to 12 minutes. The potatoes should not be cooked all the way through or they will tend to fall apart. Transfer the steamed potatoes to a bowl and drizzle them with the olive oil. Carefully toss the potatoes to make sure they are all coated with the oil. The potatoes can be prepared to this point several hours in advance of using them. Just them aside and let them sit at room temperature. With a large slotted spoon, transfer the potatoes in a single layer to a nonstick baking sheet. Discard any excess oil or liquid that is in the bowl. Place the baking sheet in the oven and bake, turning the potatoes so they brown evenly, until the potatoes are crisp and deep golden brown, about 10 to 20 minutes. Remove the potatoes from the oven and season them generously with salt and serve immediately. It sounds too easy to be true but this might be the best oven fries I have tried yet. The trick for me seemed to be in preparing them ahead of time and letting them sit at room temperature for an hour or two. The potatoes dried out a bit even with the oil on them and this really helped to make sure they got nice and brown and crisp in the oven. you do need to make sure you flip them halfway through baking, and I flipped mine at the 10 minute mark and by about 15 or 16 minutes total cooking time they were done perfectly. Of course fries go well with just about any meal – hamburgers, hot dogs, steak, fish, meat loaf, ribs, chicken, you name it – and this one is easy enough to make any time. 2 pounds of russet potatoes might only be 3 potatoes (depending on how big they are) and you get plenty of fries out of the recipe. I’ll be making them again (perhaps even tonight) and they are a great go to when you don’t want to oil fry potatoes or don’t want bagged fries or have them around.